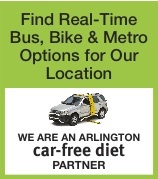 We are located conveniently 1 block from Courthouse Metro station and 6 blocks from the Clarendon metro station. Street parking is readily available and is free after 6:00pm! A parking garage is located on N. Adams St.
Our building is located between N. Adams St. and N. Barton St.